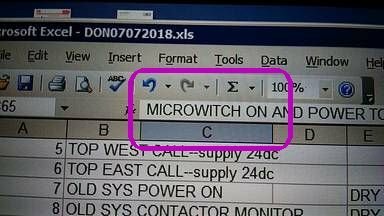 Hi all, we all do typos now and then, but this one of mine gave me a laugh when coming back to a wiring s/s a bit later. Got to watch out for those miniature broomsticks! I once returned to a program I wrote a few years later and realized I had misspelled the word "canister" as "cannister" everywhere throughout the program, on multiple screens, and in all the logs. Totally embarrassing! How many times have you seen an HMI screen (not necessarily Unitronics) with the label "Tempature"? More than once for me. Technical people tend not to be good spellers. I pride myself on my spelling, which is why the above example is particularly embarrassing. Now, if only I could eliminate copy/paste errors!